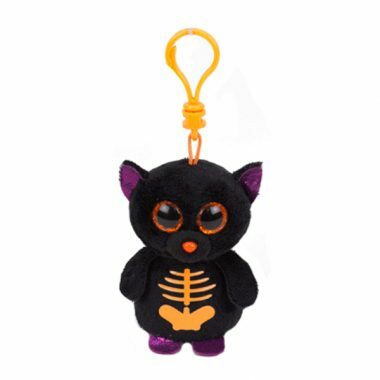 Fangs is made from a black material with large sparkly orange and black button eyes and a tiny orange nose. His ears and feet are glittery purple and he has a bright orange skeleton design on his front. Fangs hangs from a key clip. Fangs was introduced on 1st July 2015. He was released at the same time as two other Halloweenie Beanies. These were Pumpkie the ghost and Screech the owl.